Before moving to Tanzania I stumbled upon a blog post written by a teacher who was working in Mwanza, about how her whiteboard pen had been thieved mid-lesson by a cheeky monkey. I remember thinking that this would be one of the best teaching anecdotes ever which I could only dream of experiencing first-hand and subconsciously, I added it to my never ending bucket list. After moving to Mwanza, I realised that interaction with Vervet Monkeys was not only a common occurrence but was pretty much a mandatory part of every life, and in fact a group of them regularly visit my school, classroom and even my garden. 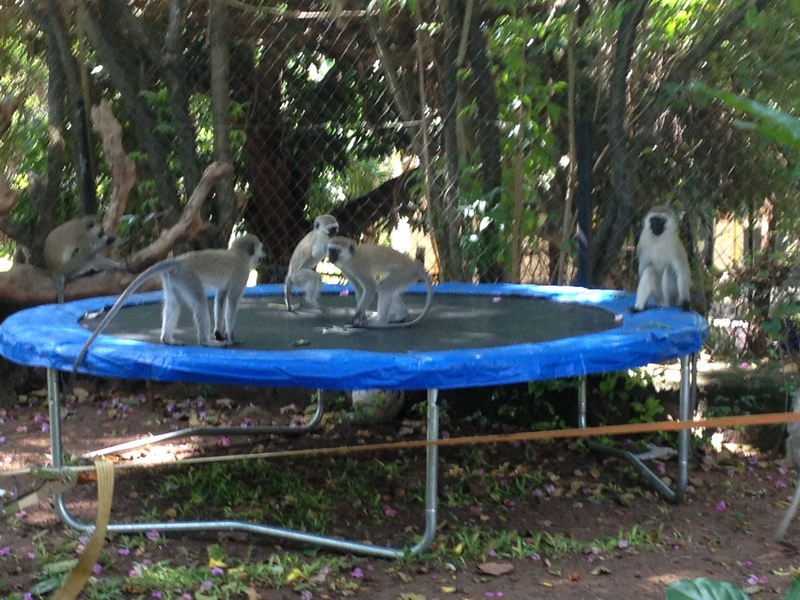 Now we regularly have a barrel of Vervet Monkeys who come into our garden to enjoy a 15 minute workout of jumping and tag team wrestling on our trampoline. So if you have a couple of minutes and like a laugh, then watch this bit of footage I captured of them in action and share and enjoy. Thanks Naomi… they are regular visitors to our garden. I shouldn’t really encourage them, but they really make me laugh so much.